Been out of the water for a while? Want to get the most out of your diving holiday in Malta? 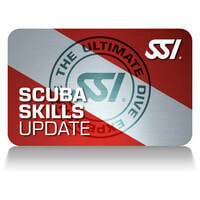 Why not book a Scuba Skills Update. This time spent with one of our instructors will provide you with the opportunity to review and practice your scuba skills. This gentle and informative session will help you refresh your skills and catch up with whats new in diving. The end result will make the dives you do with us on Gozo safer and more enjoyable.